Adjustable dial accommodates 6 different pencil sizes including triangular student pencils. Quiet operation perfect for offices and school rooms. Large capacity, transparent spill resistant shavings receptacle. Storage area for pencil organization. We at MyBinding.com are proud to present the all new Optima Electric pencil sharpener by Swingline. The new Optima is the ultimate in fast, quiet, and reliable pencil sharpening for students, office workers, artists, or just around the house. Featuring a movable dial to fit 6 different sized pencils including triangular pencils, the Swingline Optima electric sharpener is capable of reliably sharpening nearly any pencil to perfection. Equipped with carbon steel blades, a thermal cutoff, lead saver features, and quiet operation, the Optima will precisely sharpen your pencil and is ideal for any school, work, or home environment where noise reduction is a must. Backed by a limited lifetime warranty and a 100% performance guarantee, the Swingline Optima electric pencil sharpener is ensured to meet all of your sharpening needs. Check it out from MyBinding.com today and save! Dimensions: "5.88"" x 8.25"" x 8.75"
It not only puts the point back in your pencil, but it has a conveinient holder built in where you can stick your extras. Love this product. It performs great. I would receommend this product to anyone that is looking for a well built, high performance pencil sharpener. THIS IS A GREAT SHARPENER, I REALLY LIKE THAT YOU CAN STORE THE PENCILS IN THE SHARPENER. Love this stapler! It is very quiet and does a great job. The little pencil holder is wonderful! Welcome to MyBinding video. Let's look at Swingline's Optima Electric Pencil Sharpener. Are pencils driving you crazy or just those who are always sharpening them around you? Well, Swingline Optima could make your life better. Able to dial into six different pencil sizes, the workings are quiet and very quick, taking just seconds to sharpen a brand new pencil. It has a thermal cut-off that prevent over heating and a lead-saver feature to prevents from over sharpening. The carbon steel blades make for the sharpest and smoothest of points. There's even a small holder on the back end to hold some pencils, and a see-through container right in the front to hold the shavings. That is the Optima Electric Pencil Sharpener by Swingline. For more demos, reviews, and how to's, check out MyBinding.com. Whether you're a student, artist, or a draftsperson, chances are you work with pencils a lot and thus, need something with which to sharpen them. If you've tried the little handheld ones but found that you're longing for something a bit fancier, you'll want to take a look at the Swingline Optima Electric Pencil Sharpener. This is a powerful sharpener that has a lot of unique features including the ability to sharpen writing utensils of different sizes. Here's everything you need to know about this product. Check it out so you can determine if this is the sharpener that's right for your needs. Whether you're using art pencils or regular Number 2 ones, the Optima can help you out. This sharpener can accommodate 6 different sizes of pencil so no matter which writing instrument you're using, chances are this device can take care of it. You can even use it to sharpen those triangular pencils that are popular with students. To switch sizes, just turn the dial. The Optima works quickly so you can get back to writing and/or drawing as soon as possible. This little machine has a very powerful motor and carbon steel blades so you can get your pencils sharpened in what seems like the blink of an eye. And this sharpener operates quietly so you can use it around others and not need to worry about disturbing them. You don't need to worry about this device overheating because the motor has a thermal cutoff feature. The machine will shut down when necessary to avoid overheating. The Optima has a roomy shavings cup that can hold a lot of waste. The cup is made out of translucent plastic so you'll be able to see when it's getting full. Also, the cup is spill-proof so you won't accidentally wind up with shavings all over the place. When you use a sharpener, it's possible to sharpen your pencil way too much. This can cause them to be used up quickly. That won't happen with the Optima though because it has a lead-saver feature. This feature will lengthen the lives of your writing instruments. If you need a convenient place to store your writing utensils, this sharpener has a storage area. That way, your supplies will be in one place for easy access. You can count on this device living up to your expectations because it comes with a 100% performance guarantee. It's also covered by a limited lifetime warranty. 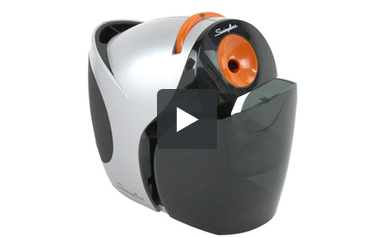 The Swingline Optima is one of the most innovative electric pencil sharpeners around. It's terrific that this device can sharpen pencils of different sizes and that you can just turn a dial to get the right size. The storage area is nice and convenient, and you'll never have to worry about shavings messing up your workspace thanks to the spill-proof cup. This product's motor is strong but it will still run quietly and it won't overheat. All together, this is an impressive sharpener so be sure to check out the Optima today. Is sharpening colored pencils in this sharpener recommended? Thank you for your question. We spoke with the manufacturer and unfortunately they do not recommend using any of their pencil sharpeners with colored pencils. Please check that the shavings receptacle on the Swingline Pencil Sharpener has been emptied. If it is full, this may be the source of the problem.